American ingenuity produce a motorized bar stool and a motorized La-Z-Boy, and now Australia's answered back with a motorized beer cooler. None are a good idea. Driving a motorized beer cooler got an Australian man pulled from the road for ten months. Chris Petrie, 23, of Queensland, was nabbed cruising in the moving cooler with three times the legal limit of alcohol in his system, according to Reuters. The cooler, which can carry 48 beers, was mounted on a frame and powered by an engine. Petrie said he bought the vehicle over the internet for $630 and assembled it at a pal's house before Petrie decided to drive it home, according to a local television station. "By the time we built it, it was quite late so we thought we'd go for a bit of a test run," he told Network Ten. Petrie was caught en route and charged with driving drunk and driving without a license. In court, the judge asked if the cooler was fully loaded and was told it was full of canned rum and Cokes, Network Ten added. When it comes to combining drinking and automotive ingenuity, Australians lag behind Americans. 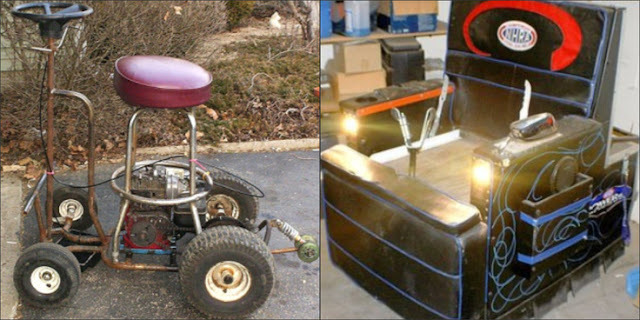 Two years ago, a Newark, Ohio, man was nabbed driving a motorized bar stool he built in his garage that had a top speed of 38 miles per hour. Kile Wygle, 28, told cops he built the contraption with a lawnmower engine and had consumed 15 beers before crashing it. Earlier that year, Dennis Anderson, 62, of Proctor, Minnesota, was nabbed driving a motorized La-Z-Boy while more than three times over the limit. His machine was powered by an eight horsepower Kohler lawnmower engine, and had a stereo, headlights, a built-in cup holder, and a "Hell Yeah It's Fast" bumper sticker, according to thesmokinggun.com.